Once strictly an extremely expensive tool used only by law enforcement and the military, thermal cameras are now accessible to anyone with a smartphone and a $250 accessory. But starting with Caterpillar’s new rugged S60, thermal imaging sensors are starting to be built right into smartphones. The FLIR ONE thermal camera started life as a bulky case for the iPhone 5, but was eventually streamlined into a compact dongle that connected to the microUSB or Apple Lightning port on the bottom of iOS or Android smartphones. 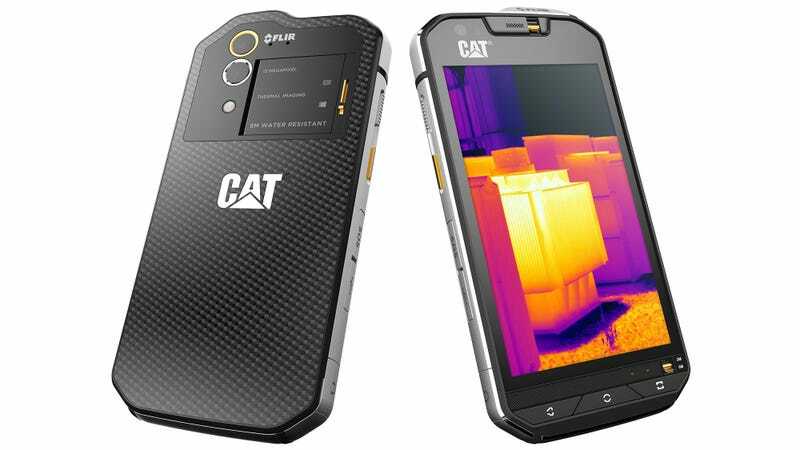 With the new CAT S60 smartphone, however, the Lepton sensor that allows FLIR cameras to see in total darkness has finally been integrated into the device itself, alongside its standard rear camera. The first smartphone to feature an integrated thermal imaging sensor isn’t exactly skinny, though. The new CAT S60 measures in at just slightly thicker than half an inch, but that’s not a deal breaker because the phone isn’t being targeted at the average consumer who wants as sleek a device as possible to slip into their pockets. Since it’s part of the Caterpillar brand, known for its bright yellow and monstrous construction machines, the CAT S60 is designed for those who are used to dealing with big tools all day long. But it’s not just the addition of the FLIR Lepton sensor, or a hefty 3,800 mAh battery, that are responsible for the smartphone’s girth. To ensure the CAT S60 is as rugged as the machinery that bears the Caterpillar name, it features a strengthened die cast steel frame inside, and is designed to exceed the military’s 810G drop test specifications. In civilian terms, its housing and Gorilla Glass 4 display can easily survive a drop onto hard concrete from a height of just over five-and-a-half feet. The S60 also boosts the waterproofing prowess of its predecessors. Previous versions of the device could survive, and function, as deep as six-and-a-half feet under water. But by flipping a couple of switches on the front of the device, which seals off its speaker, headphone port, and microphone openings, the CAT S60 can now function underwater, for about an hour, at a depth of just over 16 feet. So in other words, you don’t have to keep it hidden and protected in a pocket during rainy days on the job site. The target demographic for the new CAT S60, which includes engineers, construction workers, inspectors, or anyone needing a Tonka-tough phone, probably isn’t especially concerned with tech specs—but we are. Available sometime closer to June later this year for $599, the quad-band CAT S60 features 32GB of onboard storage, 3GB of RAM, and a Snapdragon Octa-core processor powering Android Marshmallow. It’s 4.7-inch Gorilla Glass touchscreen display can also be used with wet fingers or while wearing gloves, but with a resolution of just 1280 x 720, you won’t want to rely on it as your main device for media consumption. It supports location tracking using GPS, assisted-GPS, Glonass, and even the Chinese Beidou satellite network. And the CAT S60 includes Bluetooth, NFC, an FM radio tuner, and barometer and altimeter sensors. The front camera maxes out at five megapixels, while the rear camera manages 13. But since it sits right next to the smartphone’s thermal imaging Lepton sensor, the two can work together to create an enhanced hybrid image by merging live feeds from both cameras together. That was one of the most important innovations that FLIR introduced on the FLIR ONE, and it allowed those who weren’t familiar with thermal imaging to be able to easily decipher what they were looking at. Like laser pointers, we’ve been fascinated with thermal imaging devices every time we’ve had the opportunity to review them. Finding a practical, everyday use for either device has always been tricky, and spending $250 on a technological novelty is a tough sell. But walk around a construction site and there are endless uses for a thermal camera. Is that window frame properly insulated? Are those wires overheating? Which pipe is carrying hot water? So while the CAT S60 might not be as pretty as an iPhone 6 or Galaxy S6 Edge, it just might be the most envious tool you’ll find on a construction site—next to those towering wrecking balls.